Overlooking Dawson City is the Midnight Dome. It has an elevation of 82911 feet and is only 5 miles from town. It’s famous around Yukon for the Summer Solstice parties in June. Unfortunately we’ve just missed the party, but there the big Dawson City Music Festival in town. We can hear bits of freebie music floating up on the air as we enjoy the view. In town is a bustle of activity. Colorful tents are being hammered into the ground. Kids are staking out the parking lots with their flower-painted buses and throwing up makeshift tarps. People have canoed, biked and driven in from all over to attend. Tickets are at a premium; and if you want to go to hear the locally-grown Yukon music, its a three-day pass – or nothing. Partial passes, or one day passes don’t exist. 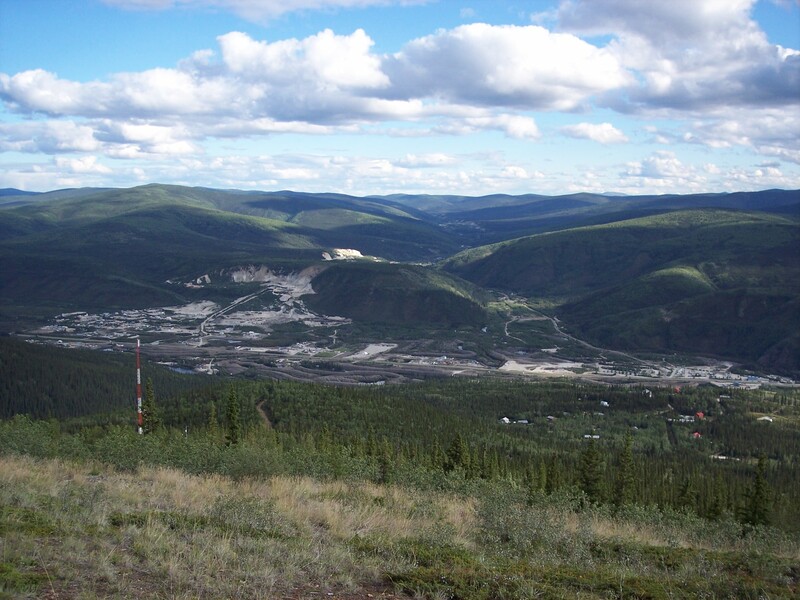 Although Dawson City is currently very small, it’s mining history had a huge impact on the surrounding environment. It is totally surrounded by the wide swaths of gravel tailings from the placer miners. The tailings are perfectly preserved. The placer mining technique which strips all the soil from the gravel and the sub-arctic climate means that it looks pretty well identical to what it would have been when the Klondikers were here. There has been virtually no flora recovery in the tailings area. If you look at the photo, you can see the big gravel scars around the town from the placer mining. 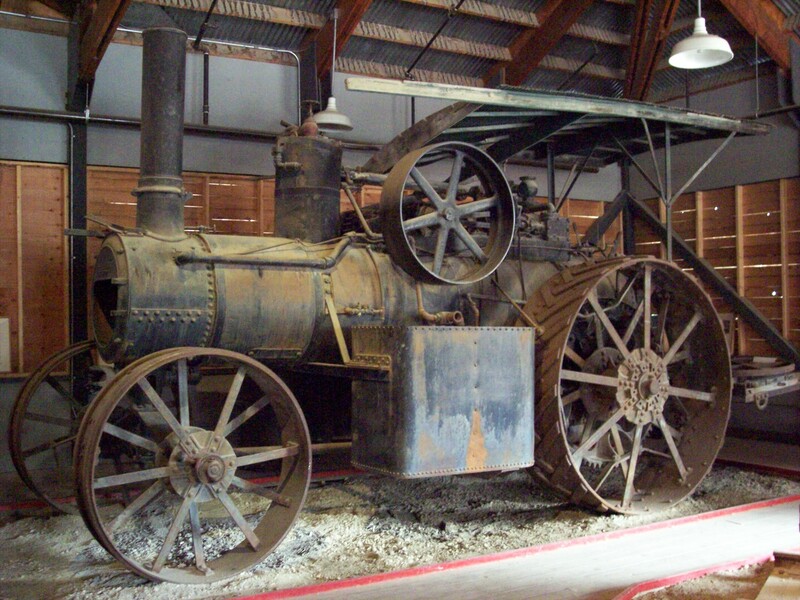 In town, the Dawson City Museum houses the largest and most important collection in the Yukon. They host various interactive displays. 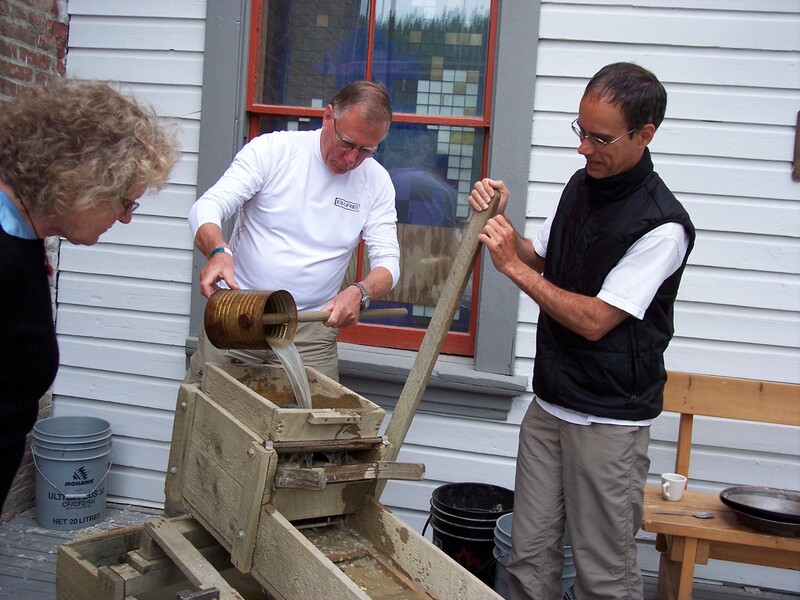 Michel got to try his hand at sluicing, which was the original way to separate the gold from the gravel. They use real placer gravel to do the demo, and Michel actually got a few flakes of gold. You start by rocking the sluice box (which doesn’t need running creek water to operate – only a few gallons in the sluice box which you keep reusing all day – that way you can placer mine anywhere – even when there is no creek!) and you end up by taking the residual gravel and panning it down to your gold flakes! From here we went to see the great Klondike innovation: the Dredge. Dredge Number 4 is a monstrous thing. In was constructed in place on the gold claim and then a giant basin was dug out underneath then filled with water. The dredge floated in a movable sink. The dredge was essentially a high powered heated water hose combined with giant conveyer belt shovel that chomped through the ground at high speed. The hot water was used to melt the ground in front of the dredge, and the conveyer belt shovel dropped the freshly unfrozen gravel into it’s internal high-tech placer shaker machine; extracted the gold bits then shot the residue gravel out the back in a spray. It’s floating basin essentially moved the giant dredge forward as it dug. The dredge, which is the size of a decent sized apartment block, only took a few men to run. Now the gold poured into town. The tour guide used to be a camp cook for some of the local placer mining companies. She describes mega-long days of hard dirty work inter-spaced with bouts of euphoria when they hit the “pay dirt”. Placer miners get a cut of the gold. You get a pro-rated split of what you find. If you find nothing – that’s your split. They ran a mini form of the No. 4 Dredge. As they churned through the permafrost gravel with their their high powered hoses, she said that every now and then they would uncover the long buried carcass of a dead mastodon. The stench would be so bad that you could smell the rotting flesh for a while as you dug through the gravel before you were actually were able to exhume the elephant sized mass. She said it was a revolting job getting rid of it. Thinking this was a stunning scientific opportunity, I asked her if they ever any attempted to preserve the remains or notify the authorities. And she laughed. There was no money in that. In fact the whole operation might be shut down if the authorities were notified while they took their sweet time doing their thing, so no one ever said anything. A mastodon find like that could cause them to lose the whole season. There was never any compensation for downtime. The government didn’t care what it cost the little guy. She went on further to say that in the permafrost soil that was churned up, strange, beautiful erupted in the short summer heat of the north. Plants that she had never seen before. Plant seeds that had been frozen in time for millennia, now blossomed into strange enormous flowers that neither she nor anyone else on the crew had ever seen before – even though all of them had lived in the area for decades. But the flowers never got to full maturity because the age and climate had been much warmer when they were buried. And the cold quickly killed them. She said that she had tried to save some of the soil where the seeds were buried, and even now had them wrapped in her freezer. She was planning to try growing them sometime in the future when she had time. I didn’t have the heart to tell her that it probably wouldn’t work. The cold of the freezer wouldn’t be equivalent to the permafrost cold. Here seeds were probably dead. I wonder how many other Mastodons we’ve lost? Very, very cool post. From Mastodons to prehistoric flowers. How cool is this?